Tuesday April 20 1909 I was busy with the house-work. We had dinner early. Will and I went away in the buggy at 12.30. Took some potatoes to Aunt Lib and Will went up to Kettlewells to go out and look at roads. I drove over home awhile. Stopped at Otts and came to town for things needed. "Nellie" acted awful. It makes me so tired to drive her. I stopped at Woolfs a moment. Will was home first. I did the work and went to bed early. Wednesday April 21st 1909 I did baking and churning. I was till three oclock getting everything done and table set for company. Fred Mollie & Carrie came at 5.30 and Willie an hour later. They seemed to enjoy their supper and we had a fine visit. They went home at 9.12. It rained early in the day. But all right in evening. 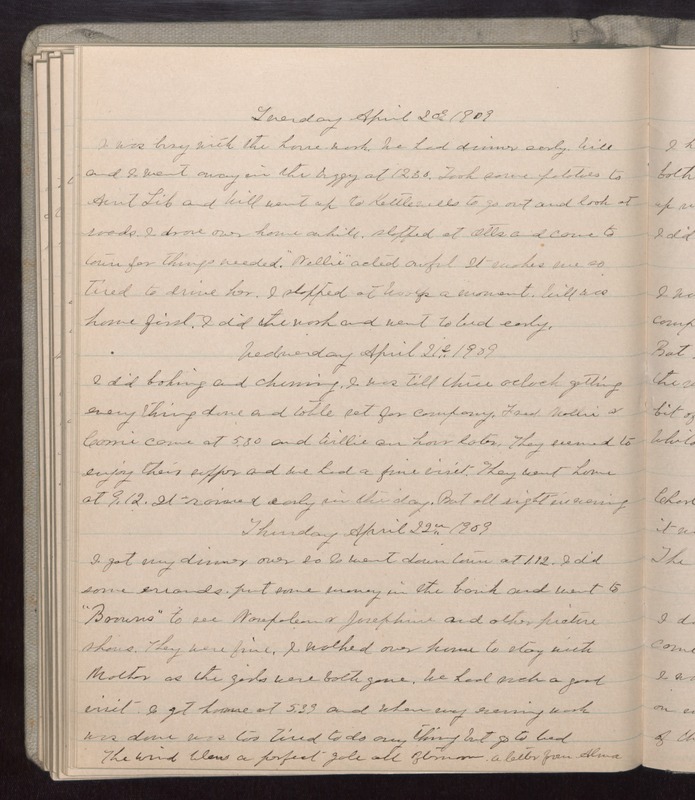 Thursday April 22 1909 I got my dinner over so I went down town at 1.12. I did some errands, put some money in the bank and went to "Browns" to see Napoleon and Josephine and other picture shows. They were fine. I walked over home to stay with Mother as the girls were both gone. We had such a good visit. I got home at 5.33 and when my evening work was done was too tired to do anything but go to bed. The wind blew a perfect gale all afternoon. A letter from Alma.